To be a successful entrepreneur you need to organize your time effectively. Planning out your week is a great way to ensure you stay on task and get things done on time. The market is flooded with todo list apps and reminder notifiers to help you stay on track on the go. Finding the right one for you is easy. You can check out our previous article, Creating the Ideal Workspace for Your Small Business, for ways to organize your whole office. Setting up your calendar can be a time consuming task that you might not want to ever do. The best way to organize your calendar is to create different sub calendars for different types of events. Color coding them is also a great way to differentiate. Blue entries could represent work events and/or meetings. Red entries could be personal appointments. Green entries represent holidays, and so on and so forth. Even simple events like getting a haircut can be added to ensure you don’t miss anything. You can keep your personal and work calendar separated depending on personal preference. 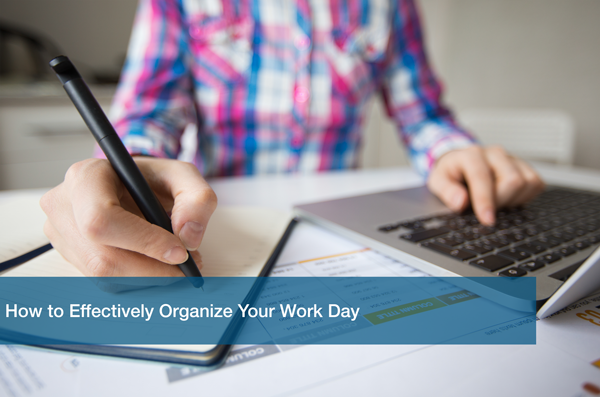 Keeping your days organized is a way great to stay productive during the week. Everyone at one point has created a todo list and then forgotten about it. It can be hard to keep up with. Fortunately, there are loads of apps on the market that can help with this. One app that you can check out is Any.do. Any.Do is an app that lets you create multiple lists depending on when you want to get things done. They have a “today”, “tomorrow”, and “someday” list, so even the eventually tasks are accounted for. You can also set reminders for things that you want to get done at a certain time. If you need to pick up milk on the way home from work, set a reminder for the time you usually leave the office. The app is simple and easy to use. You can download it today for iOS or Android. I never start a meeting without having OneNote open on my computer. OneNote is like a virtual notebook that can you add anything and everything to. Create a notebook with color coded sections. Add drawings and diagrams for projects. Append a recording of the actual meeting so you don’t forget a single detail. It even lets you screenshot things from your computer to paste into your notebook. OneNote is the ultimate tool in note keeping. Start a new project notebook and keep all aspects of that project together in one place. OneNote has made physical notebooks a thing of the past. Staying on task is essential to make sure everything that needs to be done is done on time. Keeping your notes in one place and setting reminders is a great way to start. Making these steps a part of your daily routine will bring promising success. If you need any help setting up these apps for you or your company, fill out our Free IT Analysis today. We can help keep your whole office on task and on the path to success.